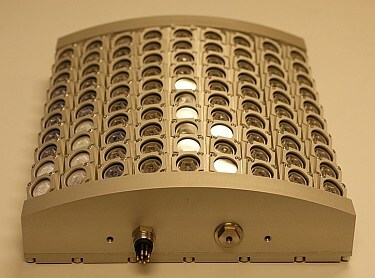 TileFish is a low power LED based camera system generating an image mosaic of the seabed. It is optimised for use on AUVs. It has an install base on Hugin AUVs. TileFish is available in monochrome and colour versions. TileFish™ has been developed by Norsk Elektro Optikk AS in cooperation with the Norwegian Defence Research Establishment (FFI). 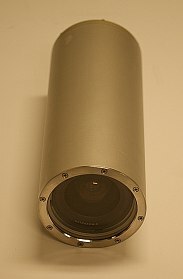 TileFish is a factory installed option ("TileCam") on Hugin AUVs manufactured by Kongsberg Maritime. This figure shows how the TileFish™ system can be mounted on a Hugin AUV. 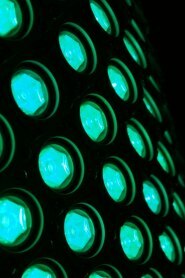 The system is available in a monochrome version with blue/green LED illumination as well as in a colour version with white LEDs. These pictures shows the LED panel (turned on) (left), The complete LED panel (centre) and the TileFish camera unit 3000 metres standard version. This picture shows a drum (barrel) and a sea cucumber. This picture was acquired using a TileFish camera system. The datasheet for the TileFish™ system can be downloaded here (pdf-format). LaserShark (TM) is trademark of NEO Subsea AS. © NEO Subsea AS 2016. All rights reserved.